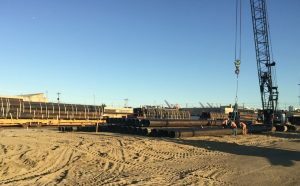 The 48-inch AMERICAN Flow Control gate valve and 48-inch AMERICAN Ductile Iron Pipe were delivered to the job site 72 hours after the main break, and the line was put back into service on Dec. 22, 2017. This story also appeared in Water Online. 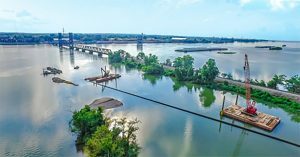 For Louisville Water Company, the goal was to get the water back on and system pressure stabilized as soon as possible. When a trusted partner was needed to quickly supply the valves and piping for the repair, AMERICAN Cast Iron Pipe Company responded. 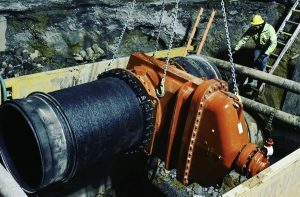 According to Louisville Water Project Manager Michael Meyer, the water main break was caused when a more than 120-year-old, 48-inch transmission main split down the side. It was one of the largest mains in the system. Crews worked for six hours to get the majority of the main shut down and turned off more than 60 valves to isolate the break. Louisville Water was able to temporarily reroute its supply and restore water service and pressure to customers the day after the break. While working to shut down the main, the emergency crew determined it would need to replace an older 48-inch gate valve. Within 72 hours of receiving the call, AMERICAN Flow Control provided one 48-inch and one 24-inch resilient wedge gate valve, and AMERICAN Ductile Iron Pipe delivered a section of 48-inch ductile iron pipe to the job site. Meyer said once the valve and piping were installed, the trenches had to be backfilled and the water line flushed. After water testing was completed, the main was put into service on Dec. 22, just in time for the holidays.